iTunes is empty, but you still have got all your music in your iPod? Get your music back, easily, and import it straight to iTunes! xPort for Mac allows to transfer all your music and podcasts, your play counts, ratings, artworks from iPod to Mac, and this very easily! 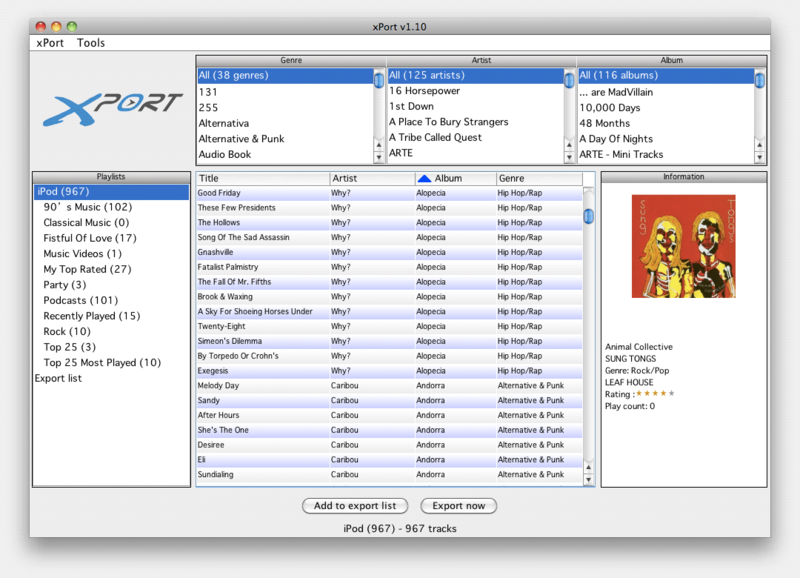 xPort not only copies the music from your iPod to Mac, but also imports data related to music such as play counts, dates added, ratings, as well as the album covers! Mac OS 10.3 and Java version 1.5 or higher. * Allow to listen to iPod music in every media player with a m3u playlist. * Copy 25 GB of music off your iPod to Mac in less than an hour. * Find the lyrics of your favorite songs in internet. Why should I use xPort for Mac? iTunes is a very good multimedia player, but is quite limited when it comes to managing the iPod. As for example the fact that it only performs one-way transfers, has caused so many headaches! Imagine that your Mac hard drive gets damaged. It would be impossible to get your music back! Still not convinced? How would you do to retrieve this nice song you have erased from your Mac but that you still have on your iPod? xPort is the most appropriate solution. Find your music back in iTunes in only a couple of clicks and transfer iPod to Mac. Qweas is providing links to xPort for Mac 1.10 as a courtesy, and makes no representations regarding xPort for Mac or any other applications or any information related thereto. Any questions, complaints or claims regarding this application xPort for Mac 1.10 must be directed to the appropriate software vendor. You may click the publisher link of xPort for Mac on the top of this page to get more details about the vendor.